The current player moves one of his/her knights similar to the knight-movement in classical chess (two squares vertically and one square horizontally, or two squares horizontally and one square vertically). The knight can jump over any pieces, but the targeted field must either be empty or hold a single enemy piece; that piece is then removed from the board. 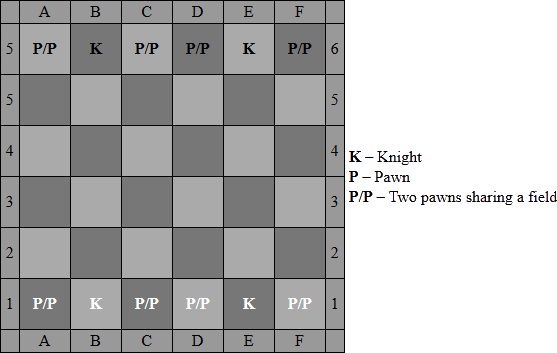 The knight cannot move to a field on which either another piece of the current player is located, or a field where two pawns of the enemy player are located (Except for special moves). any other pawn can be used. If the field, the knight in step 1 was moved to, was empty or occupied by an enemy knight, a second pawn must be moved. Any pawn of the current player, except the pawn moved in step 2, can moved from its current field to any field which is either empty or occupied by a single pawn of the current player. After these steps the other player makes his/her move. If a player cannot move any of his/her knights that player loses the game. Knights removed from the board can never enter the game again. If both knights of a player are removed from the board, that player has lost the game. Neighbor Attack: If a knight of the current player is standing on a field which is directly neighbouring (not diagonal) a field with knight of the other player, and if that knight of the other player was not moved in his/hers last turn, the current player may directly attack that enemy knight. This move replaces the normal move (step 1). The steps 2 and 3 will be performed as usual afterwards. Switch-Move: Instead of the normal move (1) a knight may switch position with two pawns sharing a field. The knight is moved to the field of the two pawns. One pawn is moved to the field the knight was previously placed on, and the other pawn is removed from the board. The players turn is then ended. Steps 2 and 3 are not performed. This work is licensed under a Creative Commons Attribution-NoDerivs 3.0 Unported License. To view a copy of this license, visit http://creativecommons.org/licenses/by-nd/3.0/ or send a letter to Creative Commons, 171 Second Street, Suite 300, San Francisco, California, 94105, USA. You are free to share, copy, distribute, and transmit the work. You must attribute the work in the manner specified by the author or licensor (but not in any way that suggests that they endorse you or your use of the work). You may not alter, transform, or build upon this work, except for referencing on this work when writing your own specifications on user extensions using specific metadata entries and user type data blocks.